In 1986 Peugeot launched a more powerful version of the 205 GTI with a 1.9 engine and 130bhp. It was a pretty and competitive rival to the Golf GTI and Nova GTE and one of the sweetest handling hot hatches of all time. Since the 205 was dropped in 1993, Peugeot have lost their hot hatch mojo, so fast forward 2 decades and let's see how they fare now. To find out I have spent a week with Peugeot's latest offering the 208 GTI to see how it stands up against stiff completion from the Fiesta ST to Clio 200 Turbo. When I first sat in the car I was disappointed, the plastics felt cheap, there was a sharp piece of plastic on the handbrake, the gearknob felt plain weird and the steering wheel obscured the dials. The first drive and with kids in tow was non-eventful which got me thinking what was all the fuss about, the press have given the car a motoring halo but I just didn’t get it. I felt bad that I would have to give a poor review on my first Peugeot media car and that it would also be the last. Through the week the car began to grow on me, I adjusted my expectations to the interior plastic quality (I have been spoilt recently with Audis, BMWs and Jags and friends have commented what a nice cabin it has) and began to appreciate the not so subtle styling exercises both inside and out, and the chassis and engine started to shine through. By the weekend it put a genuine smile on my face with the prospect of going for a drive, it’s genuinely capable and jolly good fun. The outside has some nice styling touches in a nod to the 205 of old, there’s red detailing everywhere but with a little chrome bling to bring it into the 21st century. The front and rear lights with LED highlighting ‘melt’ into the side panels and look classy and integrated. Body coloured side skirts and arch extensions don’t add any width to allow larger wheels but visually break up the vast expanses of metal and work well to sport it up. The front grille is described as ‘3D chequered flag’ and whilst I’m not sure how they got to that description it is funky and adds some more character. Add a large sculptured rear spoiler and some chrome mirrors and job nearly done. The last external job was to recreate and update those C pillar badges, and they are set in a chrome line running from just in front of the mirrors and rising up toward the C pillar. I think they’ve got it spot on. On the inside and the designer’s had an Iron Man fetish. There are flashes of red and chrome everywhere you look which shows off an individual character for this little French Fancy. There’s a black blended to red colour scheme on the door handles and dash which works really well and the red LED light around the instruments looks great at night. The seats are comfy and well supportive in the corners and have flashes of red and leather along with GTI branding at the top. The theme is continued in the rear with surprisingly roomy back seats and part leather with flashes of red trim. The controversial positioning of the dash clocks in front of the windscreen means Peugeot had to fit a small steering wheel but that turns out to be a bonus as it’s a joy to use, it’s a fat-ish diameter covered in quality perforated leather with a red tab at the top (a nod to rally cars to highlight when the front wheels are pointing straight), stereo controls and a red and chrome GTI badge at the bottom. If you were to close your eyes and put your hands on the wheel it is in a good driving position and, as it’s a tall car, it gets away with the position of the clocks high up. So whilst alien at first once acclimatised its perfectly acceptable. And the feel through the wheel is really good, a nice weighting with accurate wheel positioning. The 7” infotainment tablet style touchscreen is perfectly positioned high up on the dash to enable reliable inputs and provide a great view of what it’s displaying. It can be used to provide navigation maps, iPod, Aux, Radio and Bluetooth display or as a fuel computer. The colour display is bang up to date and the colour sat nav mapping superior to my Tom Tom. It works very well and the nav instructions are also spoken and appear on a small colour display between the speedo and rev counter. My only criticism is that you can’t input a full UK postcode but that aside it’s up there with the best. Mechanically the engine is shared with the Mini Cooper S which is a 1.6 High Pressure Turbo unit rated at 200bhp and 203 lb/ft torque which is plenty in a 1160kg shell. Emissions are down from previous year's cars and fuel economy is quoted as a combined 47.9mpg which I seriously doubt you will match if you read on. So the engine's really the easy bit, where Peugeot needed to shine and seriously pull their socks up was the chassis. It uses the standard recipe of Macpherson front struts and rear torsion bar but it’s been lowered, the track width increased by up to 20mm, the roll bars beefed up and the subframes have been strengthened. The brakes are 302mm front and 249mm rear disks with red callipers and provide plenty of bite. The standard fit alloys are 17 inch ‘Carbones’ and are available in 3 various shades in the centres with the outside face being polished. They remind me of a dog’s hind leg with the kick off one of the spokes. They are wrapped in 205/45/17 Michelin Pilot Exalto tyres and the whole package looks great against the car filling the wheel arches nicely. They do not need to be any bigger which would then spoil the ride. On a bit of a nerdy note the heater controls go up in degrees but when getting closer to the mid temperatures they step up in half degrees enabling the perfect temperature to be selected. It’s not something that I would use as my OCD doesn’t let me select half degrees but for the few that can it saves some time having to tab all the way through the temp scale in half degrees. The first time I drove the car it felt lukewarm and not so special but as I drove it more it gelled with me, I learn how to extract the most from the engine and how hard I can push the chassis. The engine needs to be thrashed to get the most entertainment from it and the accelerator pushed hard into the floor and past where you think it stops and only then does it reveal it’s full potential. The power delivery is very linear with no such peaks, just a pull from 1,000 revs up to it’s 6,200 rpm redline and it spins the wheels very easily in first at low revs quite by accident and on many occasions I found I could even spin them in third in the dry. The 6 speed gearbox has a positive and clean shift action and the gearing is spot on for quick fire acceleration. At first I didn’t like the gear knob, thinking it was OTT but found it had leather on the back and the feel of it grew on me over time. It will just hit sixty in second gear in 6.8 seconds and sixth gear is a great cruising gear, at seventy it’s doing less than 3,000 revs so can be a quiet and refined cruiser. When pressing on the chassis shows true quality and after a week I can declare they have finally found their mojo with a lovely French blend of grip and fluidity. I secretly suspect they have brought the chassis engineers from the 1990s out of retirement as it’s just magic the work they have done to compliment the full fat engine power. The full power and cornering grip is impressive with no torque steer (and note it has no LSD) but the stability control reigns in some power to a spinning wheel so it just grips and grips. Even the brakes are spot on, the large disks bringing it down from high speed with control and pedal precision. The car just wants to be thrashed so that quoted mpg figure will rarely be met as you grab it by the scruff of the neck at every opportunity. When travelling home from work on Friday night on my route of very country roads I was having a whale of time and the only other car I could think of that would better the drive was an A45AMG, which is nearly twice the price. The excellent Michelin tyres were working hard but in complete control and informed me when the car was close to the limit by the feel of some scrubbing through the steering mid corner. As it soaked up the roads and devoured the corners I had this weird thought in my mind about robbing a bank just so I could enjoy the chase afterwards, it was an unreal and a joyous experience. Wet weather handling was tested in the week with our beautiful English weather (not!) and it coped admirably. I had complete faith to push the car as much as 95% as in the dry and not a sweaty palm in sight. Whilst I have thoroughly enjoyed the driving experience there are some bad points about the car which I need to raise and can easily be fixed by Peugeot. First off is the engine noise or lack of should I say. It has no emotion, it’s just an engine being used and needs some beef to match its power and the quality of the chassis. A sports exhaust and some induction noise in the cabin would be really appreciated and raise the driving experience. Hopefully this will be available as an option soon. Second is the sound system connection. It has been blessed with a really funky tablet style display and some good quality speakers but theres no CD player as standard (it’s a £240 option), instead relying on DAB and conventional radio and iPod or aux connections. 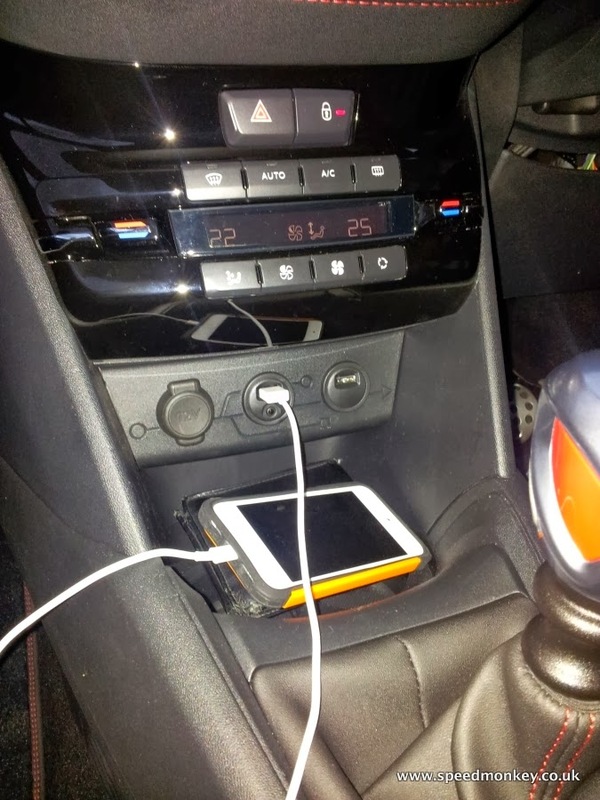 Also the iPod and aux connections are located conveniently at the base of the centre console but this means that you have to unplug every time you leave the car as your devices will be visible to opportunist thiefs who wouldn’t think twice about smashing a window for a £200 iPod. A connection in the glovebox would cure this. Third is the sharp plastic on the handbrake which just needs smoothing off. The 208 GTI is priced from £18,895 and this car featured upgraded sat nav display, metallic paint and fog light cornering assist taking the price up to £19,860 which is good value for the car as a whole as it is well specced. The competition is the Clio 200 Turbo starting at £19k, Mini Cooper S from £18k and the Ford Fiesta ST from £17k. In my opinion the 208 is dynamically on par with the Fiesta and the interior has more French flair with its Iron Man styling. The Mini is poorly equipped as standard so a comparable model will be £23k and the packaging isn’t as good as the 208 with it’s generously tall cabin and spacious boot. The Clio has ruled itself out of this game with its automatic only transmission. I hope this little car rejuvenates Peugeot as it’s spankingly good and if you are interested in this sort of car make sure you have one on test for a few days as it’s a real grower. I have trashed this car with the kids in and they didn’t complain like they usually do in my TT, it feels very secure and importantly made them feel safe. The car has obviously been targeted towards a younger audience with flashes of red and chrome and the tablet display with iPod connection but no CD player which is what today’s youth want in a vehicle. So with Peugeot’s mojo now firmly back in house let’s hope they can bring some more charm and energy with a 208 GTI-R. 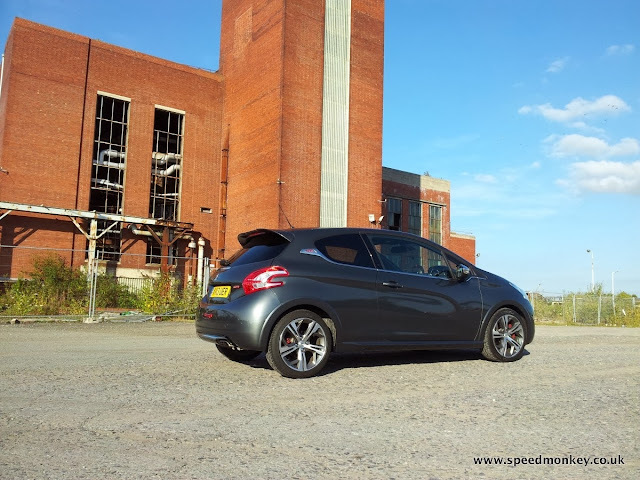 The 208 GTI, it’s a great little car!